When I mention Bosch – what springs to mind? Dishwashers, Gas Cookers? Yep me too. But the team behind our home appliances have put their expertise to good use and applied it to heated hair appliances. The recently launched range includes a ProSalon Sensor Straightener, a KeratinAdvance Straightener and hair dryer, as well as a ProSalon compact hair dryer, and finally a ProSalon Big Hair Curling Wand. At the launch event at the Ice Bar in London, Lisa Laudat (hair stylist to Cheryl Cole) showed us how to use the appliances to create a variety of looks, from undone messy ‘I Woke Up Like This’ hair, to super glamorous waves. My favourite look which I couldn’t wait to try at home was the everyday curl, created using the KeratinAdvance Straighteners. My friend Sophie has got the world’s most perfect hair. 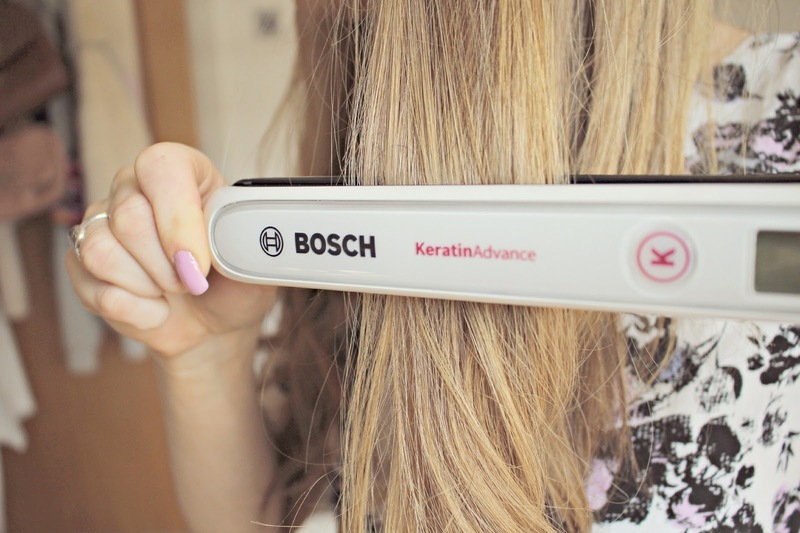 She always has beautiful curls and I’ve been dying to know her secrets, so was so pleased when she offered to show me with the Bosch KeratinAdvance Straighteners! 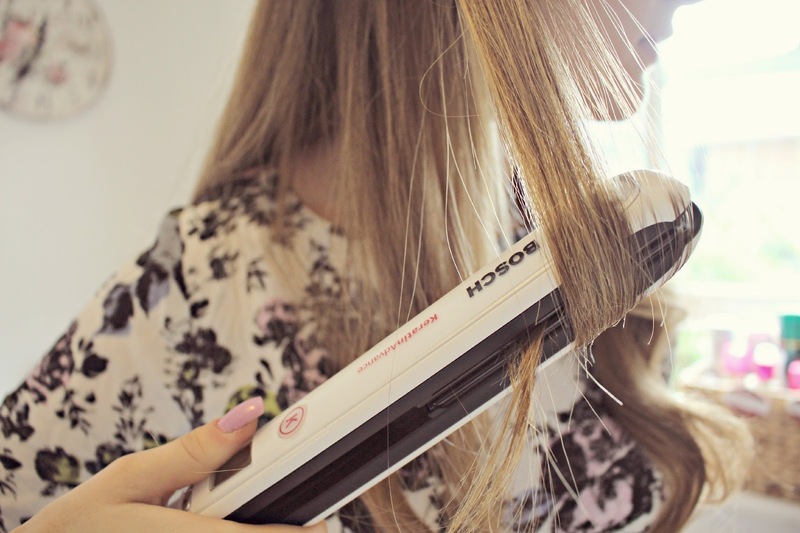 The straighteners have a +/- button to allow you to alter the temperature – thicker hair requires more heat, but Bosch engineered the straighteners to ensure that the temperature would never damage hair. We set the straighteners to 190degrees for Sophie’s long thick locks. 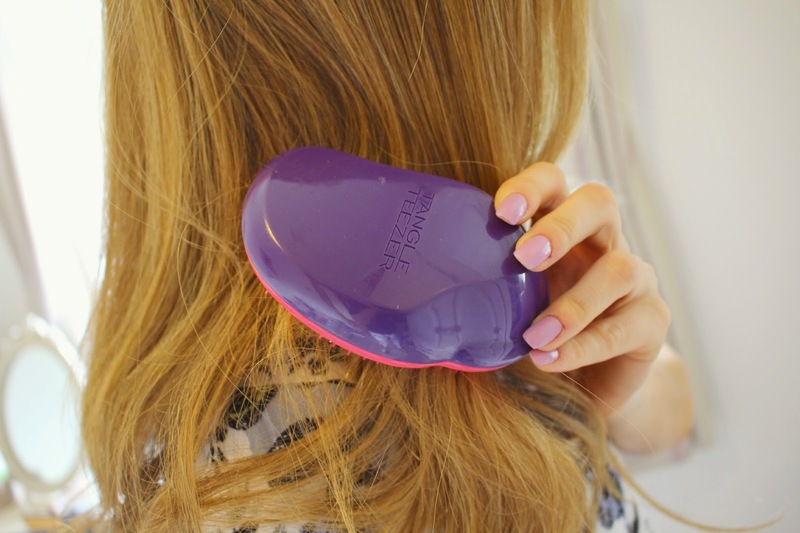 While the straighteners heat up (this only takes a minute) Soph detangles her hair using a Tangle Teezer – it’s gentle enough to not damage hair, while the bristles effectively remove stubborn knots. Sophie then sections her hair, using a large clip she leaves just the bottom third of her hair down before re-brushing this section. I’ve always used protection spray, but the pros at Bosch recommend that you don’t apply additional product to the hair – as it just means you have to turn up the temperature of the straighteners. For an everyday look, Sophie prefers to leave the top section of hair straight and just curl the ends, so she runs the irons over the top section, then, about halfway down, she clamps the irons, and twists away from her face. Sophie tells me that the faster you pull the straighteners down, the looser and more gentle the curl. 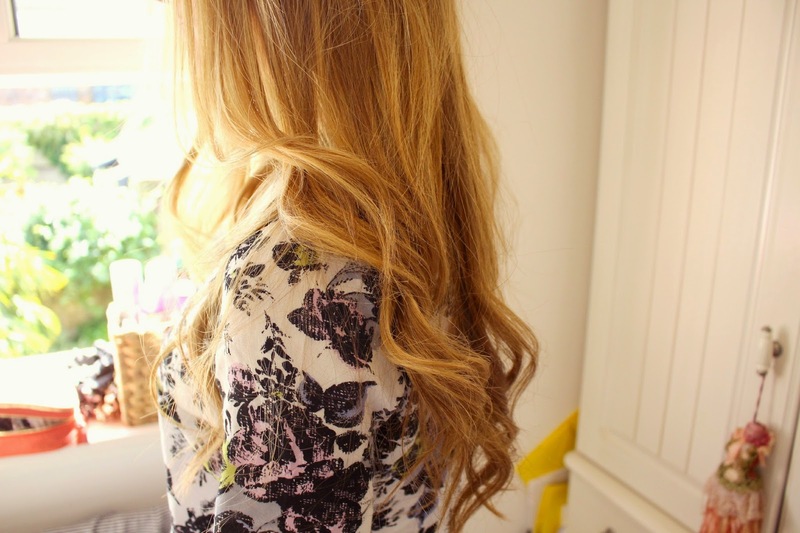 On the other hand if you want a more defined, tighter ringlet, move the straighteners through hair more slowly. 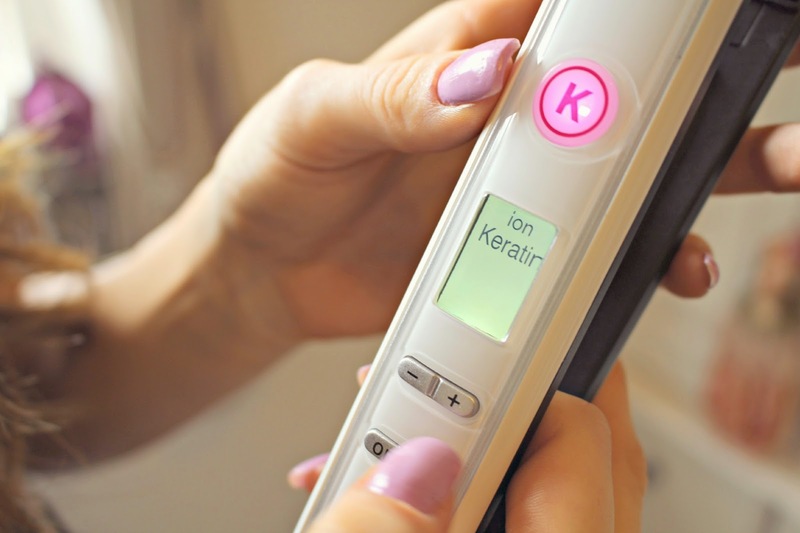 Soph and I both have coloured hair – the KeratinAdvance straighteners have a Keratin Button which offers extra protection and ‘colour save’ so as not to dry out coloured locks. We ensure this is pressed when straightening and curling. Next Sophie lets down the middle section of her hair and repeats the process. Finally for the top section, she teases it slightly with a comb to give a little extra volume before curling again but this time using smaller sections. She finishes by running her fingers through her hair, or when she wants softer waves, she goes through again with the Tangle Teezer. 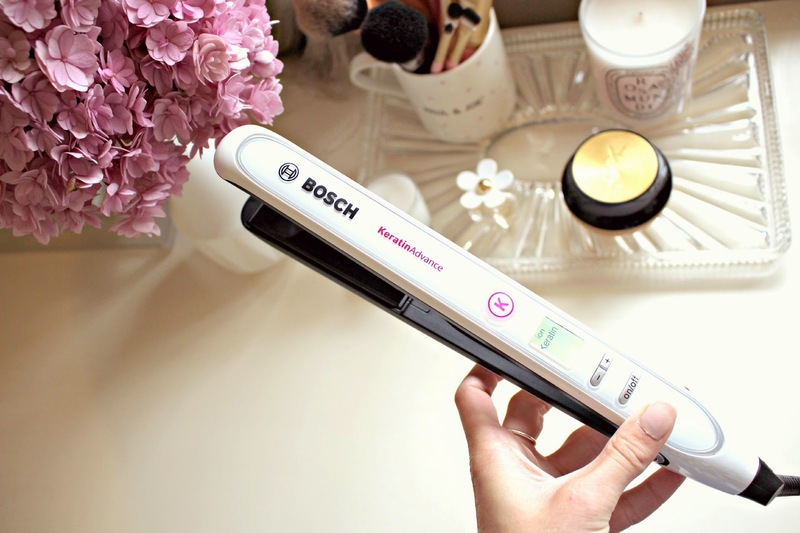 The Bosch KeratinAdvance straighteners are ideal for creating everyday curls – the floating anodised plates are perfect for twisting the hair around the barrel, and the cord has a swivel function meaning no more tangled cables when you twist the straighteners. For extra peace of mind the straighteners also have auto-shut off, and the best part of all is that they are only £44.99!! Oh – and they straighten pretty darn well too! Thank you Sophie for showing me how to re-create your beautiful curls – and to Bosch for the absolutely brilliant straighteners! 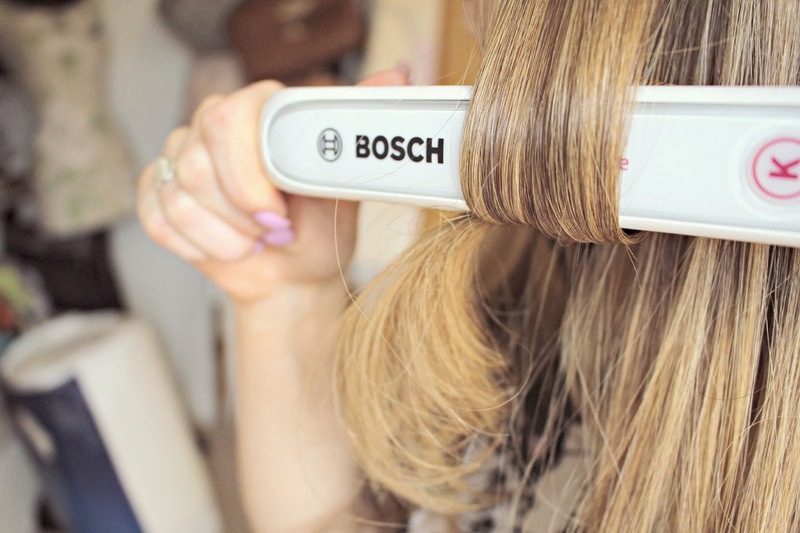 The Bosch Hair Appliances range from £39.99 to £89.99 and are available to buy online here. Next Post Bust and Body firming with Clarins!